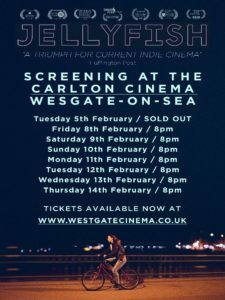 Margate feature film Jellyfish, scoops four Hitchcock awards at Dinard Film Festival and is currently screening at the Charlton Cinema – Book your tickets now! Feature film Jellyfish, is a beautifully shot, indie dark-comedy set against the backdrop of Kentish seaside town Margate. It is the directorial debut of James Gardner, a NFTS graduate. It has been doing the rounds of the festival circuit – picking up an award for best film at the Rome International Film Festival, as well as several Hitchcock awards at the Dinard Film Festival in France. It is also currently on the list for the British Independent Film Awards for Most Promising Newcomer and Debut Screenwriter awards. Jellyfish centres on a 15-year-old carer who discovers she has a hidden talent for stand-up comedy. Encouraged by her drama teacher, Sarah Taylor (Liv Hill) works on a comedy routine for the school’s graduation showcase, but as the date draws nearer, she struggles to balance everything in her life. Starring emerging new comer Liv Hill (Three Girls), Sinead Matthews (Mr. Turner), Cyril Nri (Cucumber), Angus Barnett (The Pirates of the Caribbean series), and Tomos Eames (Burn Burn Burn). Margate is the quintessential seaside town and a popular location for film and TV, having been featured as the main back drop for programmes such as Edge of Heaven (2014) and the BBC drama True Love (2012). It was also the setting for Only Fools and Horses: the Jolly Boys Outing (1989) – a Christmas special in which the gang enjoy a day out. Filmed in an observational documentary style around Margate, notable landmarks of the town such as the Lido and Dreamland theme park can be spotted in establishing shots of the setting. Other various scenes were shot in the town centre and along the coastal path. The special UK Q&A tour with cast and filmmakers began on 5th February, with the next available upcoming dates being 9th February 2019 to 14th February 2019. Find out more and book your tickets on the Charlton Cinema website here.